Your cat expresses his emotions through his tail. Just by looking at that appendage, you know if he's happy, annoyed or frightened. While the tail might not receive a lot of petting, it's important that you check it as you would the rest of your cat's body for lumps, bumps or other abnormalities. If you find a hard lump on your cat's tail, take him to the vet. An overhead view of a cat's tail. A lump in your cat's tail, especially near the tip, can mean that he broke it at one time. While you'd likely be aware of such an incident in a pet you had since kittenhood, that might not be the case in a cat who came into your life when full-grown. There's no real treatment for minor tail fractures -- they heal on their own. The lump that exists after a fracture could have resulted because the cat continued to move his tail during the healing process. A hard lump on the tail could be a tumor, either benign or malignant. Your vet can't tell whether or not a tumor is potentially deadly just by looking at it, so she'll either remove the entire tumor if it's small or take a sample from a larger tumor and send specimens for testing. Samples from a large tumor are usually retrieved via fine needle aspiration, which doesn't require anesthesia. If the tumor is benign, no more treatment is necessary, unless it's a sebaceous cyst. That's an encapsulated tumor filled with sebum, which your vet can surgically remove. 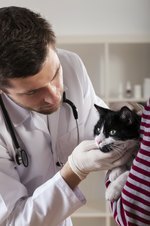 If a tail tumor does turn out to be cancer, your vet might recommend tail amputation. A large, painful swelling on your cat's tail could indicate an abscess. Outdoor tom cats are most likely to suffer from tail abscesses, since most abscesses result from fighting. The tail area is a common site for bites, as the dominant tom cat might inflict a bite as the other cat flees. Bacteria from the bite cause the site to fill with pus. Within a few days, you'll notice hair loss around the swelling. If your cat hasn't already gone to the vet to have the abscess lanced, it could break at home. It's amazing how much pus and blood can come out of one feline abscess. In addition to lancing the abscess and cleaning it, your vet will prescribe antibiotics to combat infection. Large abscesses might require a drain. Although tom cats primarily develop stud tail -- hence the name -- neutered males and females can come down with this malady. Technically known as supracaudal gland hyperplasia, stud tail symptoms include a mass of hair at the tail's base, which can feel like a lump. The area is smelly, oily, crusty and possibly infected. Your vet will clip off the matted hair and recommend degreasing shampoo to get rid of the excess oil, caused by sebaceous gland overactivity. If an infection exists, she might prescribe antibiotics. If your cat isn't neutered, your vet will recommend that surgery.